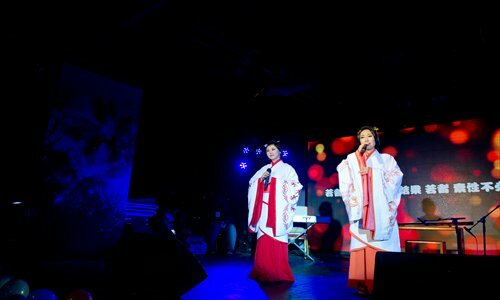 A new type of music, gufeng (roughly translated as a nostalgic trend), is finding its way online. What now seems like a movement began rather quietly in 2005, calling for netizens to write lyrics with ancient-styled poems for the music in some popular PC games, including The Legend of Sword and Fairy and Sword of Xuanyuan. As a lyricist Qishi recalled, the early gufeng music lovers are fans of games who gather at fenbei.com (a now closed music sharing website) and the BBS (Bulletin Board System) of The Legend of Sword and Fairy. "There was a group on fenbei.com called Gufeng Tianci (write lyrics using classical Chinese), and the basic concept of gufeng among netizens came out from that group." "The early creation of gufeng music focused on lyrics, but that was not the key to setting up a new style of music," according to Wellson Cao, also known as Diuz, the leader of the music group Mo Ming Qi Miao (MMQMusic). Readily available midi software made it possible for music lovers to compose, record and mix the music at home, allowing more netizens take part in creating gufeng music. It can be heard on music sharing websites like kugou.com or 5sing.com. It is hard to have a consensus among all the composers how to define gufeng music. Lu Xiaoxu, the head of Beijing Xiao Xu Music Culture Company, gave his definition for gufeng: "In broader terms, I think gufeng music should be called zhongguofeng (China trend), which is a type of pop music using traditional Chinese musical instruments, while in a narrower sense it means a group of music lovers online who cover, perform, rework and compose the genre." "Jay Chou is the originator of zhongguofeng music. He mixes traditional Chinese elements with pop music very well and promotes this kind of music to the mainstream," said Lu. But Huiyuanqiong, a popular gufeng composer, distinguishes the style from zhongguofeng saying it cannot be grouped with pop music. For Cao, gufeng is a style that shows aesthetic appreciation for nostalgic music and expresses it with ancient imagery. "We are not only using music and lyrics, but also dialogue and narrative to describe a story or a scene we want to show to our audience," Cao told the Global Times. Lyricists also hold different views. Bu Lei, known as Ediq online, thinks he would like to use modern language to show one's feeling on ancient issues in gufeng music while Anjiu, another lyricist and composer, thinks it would be better to stay in classic Chinese style when expressing nostalgic views. Many of the lyricists are fans of classical Chinese poetry. Anjiu said she wrote classical Chinese poems for a long time before realizing there was a group of people online setting their original poems to music. And it should come as no surprise, because writing lyrical poetry has been part of Chinese culture for over 1,000 years. Gui Zhenyu, known as Mizi online, is a graduate of the Central Conservatory of Music. He joined MMQMusic group as a professional guqin (a seven-stringed zither) player and composer. "I am studying to merge guqin elements into gufeng music," said Gui. Having promoted the art of guqin for years, Gui regards gufeng music as a good way to make the musical instrument more creative and more accepted by the public. "Our generation was so influenced by the costume dramas of the 1980s and 1990s. The stories of the dramas happened in the old days, and we have been singing the theme songs of those dramas and movies since we were very young," recalled Cao, "Those songs are quite related to the gufeng music now." That is one reason why when people first listen to gufeng music, they feel a sense of familiarity. "Sometimes gufeng music makes me think of the songs inserted into a costume drama while my first impression of zhongguofeng music by Jay Chou or Leehom Wong is more like pop and R&B music using traditional Chinese instruments," said Bai Yuzhu, also known as Tacke Zhusang, a popular gufeng singer online. "I think stories of Chinese swordsmen are fairy tales for adults, freely expressing thought on love and hate as well as the exquisite sentiment between young lovers, which is also the theme of gufeng music," said Bai. Lu Xiaoxu has been committed to spreading music with traditional Chinese elements for over seven years. His studio held a singing competition on 5sing.com with some famous game companies last year, attracting over 3,000 competitors. Compared to other type of activities held on the same platform, the competition hit a high level of attention and participation. "We are planning to hold a concert next year to promote Ancient Sword II, which will be a masterpiece on both game and original gufeng music," said Lu. He insists that the good way to promote gufeng music is to connect the music with games and TV drama. Still, Lu Xiaoxu regards gufeng music as culture for a certain kind of minority: "I think the fans of gufeng music for now are no more than 100,000." But Cao and his MMQMusic team members have a much wider vision. They gave talks at university campuses earlier this year. "We are not only explaining the concept of gufeng music, but also performing in front of our audience to show the difference between gufeng and pop music." As he recalled, 80 percent of their audiences were fans already, but they still attracted some who did not know about it. Cao quit his job in international trade and law to dedicate himself to promoting the gufeng music culture. As an extension of MMQMusic's new year concert with an audience of 1,000 on December 31, 2012, his next step is to hold a live concert in the Nanjing Great Hall of the People, which can hold about 2,000 people. Cao said the investment for the concert has already exceeded 1 million yuan ($163,000). "We invited the orchestra from Jiangsu Province this time so that all the music played at the concert will be live." Tickets for the concert sold out on taobao.com in 20 minutes, naturally boosting Cao's confidence. "Though I did not think we could be so successful several years ago, I believe now that we can make the gufeng music more acceptable and popular."